So hey, first post for me. Heya! Figured I’d write something about the random ideas and designs I’ve collected since joining S.A.R.T., so here we go! First up is the wheel designs. 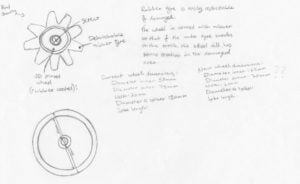 Here we have a draft containing wheel dimensions and some ideas for how the wheel could be improved from last year’s. Similar to tyres found on cars or on Lego, I’ve come up with the idea of having detachable rubber tyres for the robot. They probably won’t have an air tube (because that would be pretty difficult with all the spikes) so semi-solid rubber with small pockets of air for strength and flexibility should do the trick. The detachableness also allows the tyre to be quickly and easily replaced if something goes wrong (no more gluing! Hopefully…). 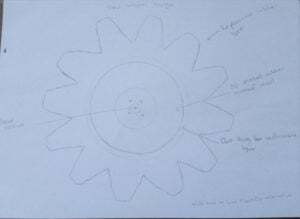 The inner part of the wheel, that can be seen if there’s no tyre, will have a rubber coating so if the tyre breaks on the track, the wheel will still have some track-tion (see what I did there?). We’re looking at using our four cameras to show us what is happening around the robot. 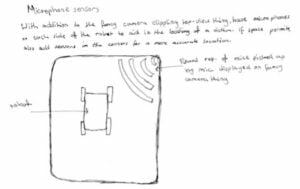 With this, it would be 10000x easier to determine the position of the robot if the controller can’t see where it is, rather than just the one camera on the front. I’ve also included in the sketch a visual representation of sound onto the screen. To do this, we’d have to have at least one mic on each side of the robot, and if space permits one in every corner too, then display on screen where the sound is coming from more accurately via how much of the sound is picked up in each microphone. Since these are rescue robots, it would make working in the field searching for survivors much easier. Bonus! 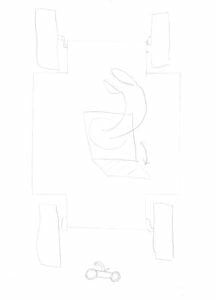 2 minute sketch of a robotic arm on the top of the robot, able to be hidden away beneath a hatch if the robot needs to turn upside down.